Richard Wagner took a major gamble with his career when he decided to leave Riga and head to Paris, His wife had become the family's sole provider, earning a modest livelihood by making guest appearances at the theater. Wagner had lost his post of musical director, and he occupied his time learning French in order to translate the libretto of Rienzi. On July 10, they left Riga successfully evading all their creditors. The Wagners' arduous journey to Paris, aboard the ship "Thetis," was an odyssey that took them as far away as Sandwiken, Norway, and back down to London. On board the wind-blown ship, Minna suffered a miscarriage. Many years later, Wagner would incorporate much of the fury of the storms that he encountered on the crossing when he set down to write the dramatic libretto and score to Der Fliegende Holländer. Finally, in September of 1839, the Wagners crossed the channel to France and met Giacomo Meyerbeer at Boulogne-sur-Mer. The meeting ended with the older composer promising to help Wagner. Though rejected by the Paris musical establishment, Wagner continued his struggle for recognition. He composed various songs to French texts in an effort to gain the favor of some of the greatest singers of the day. He even composed an aria for insertion into the last act of Bellini's Norma for the famous Italian bass Luigi Lablache. The great singer was flattered, liked the aria, but declined to sing it. Throughout 1840 Wagner tried in vain to get his operas mounted. Although the prospects were bleak, he never stopped writing music, and often took on odd jobs to support himself. For a time he worked for music publisher Maurice Schlesinger doing correction and arrangement work. Once Rienzi was completed, he set out to write a new opera, inspired partly by the intrepid journey on the "Thetis." The combination of the spectral ghastly themes of German Romanticism together with Wagner's rendition of the fury of the sea eventually developed into the version of Der Fliegende Holländer that we know today. At the end of the year Wagner petitioned the King of Saxony to accept Rienzi for a possible production at the Dresden Court Theater. In June of 1841, much to Wagner's delight, Rienzi was accepted at Dresden. On July 7 1842 Wagner and Minna finally left Paris to prepare the première of Rienzi. He took all his music with him including the finished manuscript of his new opera, Der Fliegende Holländer. From the beginning of his career Wagner engaged in a rare practice among composers of his day: he insisted on writing his own libretti. His early preocupation with literature played a big role in this creative decision. While in Paris, in 1841, he had finished the libretto to a five act grand opera called Die Sarazenin, and 1842 saw the completion of Die Bergwerke zu Falun, a libretto based on a story by E.T.A. Hoffmann. Before the première of Rienzi, Wagner wrote two prose sketches for another possible future opera, this one called Tannhäuser. 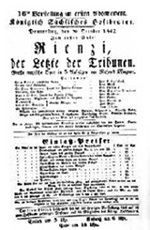 The première of Rienzi, on October 20, 1842, in Dresden, was an incredible success. The audiences of these first performances were impressed by the five hour length of the spectacle and by the rigors posed by the tenor role, two trademarks that Wagner would exhibit to the end of his life. The leading soprano role in the première of Rienzi was sung by Wilhelmine Schröder-Devrient who also would create the role of Senta and Venus in Der Fliegende Holländer and Tannhäuser, respectively. The year 1843 was particularly kind to Richard Wagner. Early in the year he conducted the première of Der Fliegende Holländer, he was appointed Hofkapellmeister of the King of Saxony's Court, and he was able to successfully borrow money in order to pay his debts that went back to his Magdeburg days. The January 2 première of Der Fliegende Holländer, at the Dresden Court Theater, left opening night audiences and critics stunned. A much more characteristically "Wagnerian" work than Rienzi, the opera lacked the customary and expected pageantry and concentrated on a brooding, dark story with a mysterious, ghostly hero. Even though the opera had the requisite arias and ensembles the audience expected, Wagner's music was turning more complex and personal and, from the audience's point of view, less popular. Still, not satisfied with the work, Wagner revised the score on three separate occasions, mostly to remove the most salient aspects of grand opera that it still had. Even though the initial performances had been presented in three acts, Wagner began to think of the work as a one act opera, which is usually the way that it is performed nowadays. As music director of the court of Dresden, Wagner's life entered into a period of considerable monetary and financial stability, while at the same time, his politics were increasingly raising eyebrows among the conservative establishment. As he labored to finish the score of Tannhäuser, Wagner drew many plans to reorganize the theaters of Saxony, a move that was very upsetting to the existing bureaucracy. Further, revolution was in the air, and Wagner was emerging as a radical. 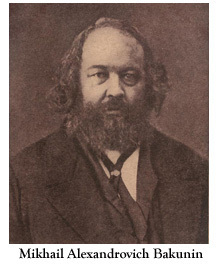 In his Dresden home he often entertained August Röckel, the editor of Dresden's radical newspaper the Volksblätter, and he had befriended the founder of the school of Russian Nihilism, anarchist Mikhail Bakunin whose tumultuous politics had led him to settle in Saxony. Years later, in his autobiography Mein Leben, Wagner wrote about Bakunin: "I felt sympathetically drawn towards this prodigy of a man when I one day induced him to hear me play and sing the first scenes of my Fliegender Holländer. After listening with more attention than most people gave, he exclaimed, during a momentary pause, 'That is stupendously fine!' and wanted to hear more." On April 13, 1845, Wagner completed Tannhäuser. The opera's score had completely been conceived in the city of Dresden. 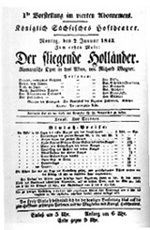 It was given its first performance on October 19. at the Hoftheater. In the same year, King Ludwig II of Bavaria was born, the man who many years later would completely change Richard Wagner's life.